Frequent travelers obviously know their luggage well. They know what works best for what kind of trips. They have probably experienced first-hand all sorts of luggage disasters. Plus, most of them usually join several travel communities/groups, where they have access to the "combined travel wisdom" of the entire community. So they get to know about all kinds of creative luggage contraptions that make travel easy. 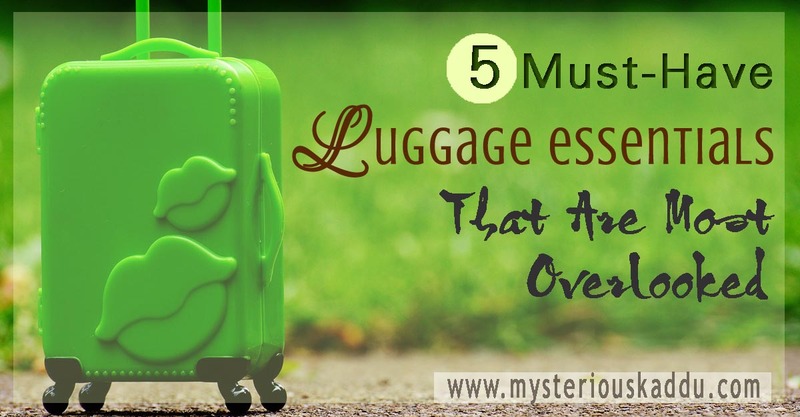 Oh but there is so much more to luggage than just this! I find that traveling becomes so much easier if you have sensible luggage with you, where everything has got its fixed place, and is held nice and secure, and you don't have to waste time hunting for things. There are a lot of innovative luggage pieces available today, even in India. Unfortunately, not everyone is aware of them. I'm sharing 5 of them here that personally make so much sense to the "organization freak" within me... 5 must-have luggage essentials that are mostly overlooked in India, especially by the non-frequent travelers. 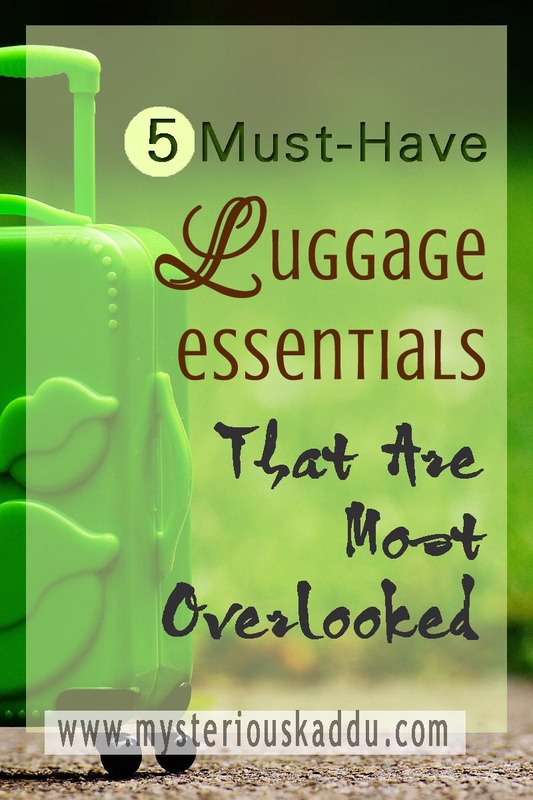 So I'm not including any of the regular luggage items in this list... things that most of us have and are familiar with. This list is only about the less-popular luggage essentials that I personally found very creative and useful, and that, if used, can make traveling so much easier and hassle-free. I simply cannot emphasize enough as to how useful they are! Especially for Indian women, with all their saris and slippery salwar suits and the delicate georgettes and chiffons and heavy embroideries! I have been using them since 2011, not just for traveling, but also for storing clothes in my cupboards at home. Although, I didn't know then that they were called "packing cubes". My sister and I just "chanced" on them while doing her wedding shopping in Patna. They instantly "clicked" with us, and we bought quite a few. And then she even asked me to get some more for her in-laws, as these packing cubes were not available online in those days. I especially like the Flying Soul Packing Cube Travel Organizer Set of 5 (4 Cubes + 1 Toiletry Bag). It's got 4 matching cubes in different sizes, which seem sufficient for storing all those clothes that are difficult to keep steady in one place. And yes, that includes the undergarments and handkerchiefs too. Plus, it's got this really cool toiletry bag, with so many pockets and elastic bands to hold practically all our bottles and jars and brushes and whatever other personal grooming or makeup items we might have. All of them together, in one place. So no need for half a dozen different pouches! It kind of reminds me of those old vanity cases our moms used to carry, remember? Tip: I'd use the second smallest one to hold my bangles. Just roll-up sheets of newspaper into cylinders, push the bangles on it, place them in the bag. Maybe use a towel napkin for padding, if required. It is sooooo convenient, I can't tell you! Note: You can buy these packing cubes without the Toiletry bag too, at Flying Soul Packing Cube Travel Organizer Set of 4 (Black). Until last month, I only knew that laptops were carried around in either sling bags or backpacks. I used to prefer backpacks while traveling, 'coz that left my hands free. But, last month, during my trip to Delhi, I saw this guy on the railway station, wheeling along a small, laptop-sized, trolley bag! And I was completely "wowed"! It's a really small trolley bag, with a padded compartment for your laptop, and space for a change of clothes. Just like your normal sling bag or backpack, you know. Perfect for a day's travel or overnight travel. Except that this one has got wheels. So you don't need to carry it around. So your clothes stay fresh. You know last month, when I was traveling to Delhi, I did such a lot of shopping there, plus all the gifts that I received, that I totally ran out of luggage space! For a couple of minutes there, I thought I'd have to go shopping again, to get another duffle bag maybe! But, you can't keep on buying expensive duffle bags every time you go to Delhi to shop, right? These are completely foldable, ultra-lightweight, waterproof duffle bags, especially meant for emergency situations like the one above. They fold up into less than 8 inch by 6 inch. Just about the size of a paperback. So you can easily throw-in a couple of them into your suitcase next time you travel for shopping, and voila! You have extra duffle bags at your service when it's time to come back home! Note: These are not as sturdy as your regular duffle bags, so best to use them for storing clothes, while all the odd shaped and sized items can go into your suitcase. I used to think that rucksacks are only used by hikers and backpackers. So I never even considered them as a luggage option for just normal travel. Until my Chennai trip in 2006. The one I mentioned in my previous post on Memories of Train Journeys. The couple I befriended during this trip was carrying a big rucksack, along with a couple of other luggage items. That's when I noticed how much more convenient it is than a large duffle bag, which I used to carry back then. Here check this out... POLE STAR " ROCKY " 60 Lt Grey Rucksack I Hiking backpack. It's available in a bright red color also. It's not so much of a "luggage" item... more like a travel accessory perhaps. But because it's also so often ignored or overlooked that I decided to include it in this list. So anyway, this is the one travel wallet that manages to satisfy the perfectionist in me. The ABYS Genuine Leather Unisex Passport Holder||Coin Purse||Cheque Book Holder||Travel Wallet||Card Holder with Metallic Zip Closure. Also available in tan color at ABYS Premium Quality Genuine Leather Tan Unisex Passport Wallet||Passport Holder||Mobile Cover||Card Stock with Metallic Zip Closure. So these are my top picks from the most overlooked, but must-have luggage essentials that make travel so much easy. Which of these have you used before? Which of these do you find the most useful or interesting? Do you have any luggage disaster stories that you might want to share here? Here's more in Product Reviews from miss_teerious! This is my 12th post for A to Z 2019. This is such a cool post. I was always a travel light kind of a person because I was a frequent traveler. Until motherhood happened and the luggage trolleys seemed to be an ever interesting mode. Very informative post Chicky! I esp liked 'packing Cubes' This is now in my must buy list... rest of the items I have. I remember vanity bag - my mom still has it but does not use it while traveling as it is bulky. I will buy packing cubes for her as well. Other than rucksack backpack, I use all the other luggage. Am not very fond of backpack. My son uses it. For bindi, bangles, accessories I have pouches. I always carry a fold-able bag even when I go for local shopping. it is very handy. I have a small folding grocery bag measuring about 1.5 x 1.5 inches. Where-ever I go shopkeepers are happy to see the bag. My hubby used to travel frequently for work and he is a great packer. He has a list of things to be taken for travel. A very good and unique topic, Kaddu. enjoyed reading it. I like the idea of packing cubes. These can keep everything so organised and in place especially for people who have OCD, like me. I have rucksack but hate using it as the clothes get so crumpled and if something is at the bottom, you have to take everything out. I took it on one trip and after that... Never! This post has come at a time when I am about to travel. Well written and it is so true that we often overlook these small things which would otherwise make our lives easier. I loved those Packing Cubes and the travel wallet! I have used packing cubes since years now, for my sarees, formal outfits, innerwear and all the etceteras. And that wallet--frankly, I don't even carry a credit card, nor do I travel, but that travel wallet is the stuff my dreams are made of! Anything with umpteen pockets is a favourite!